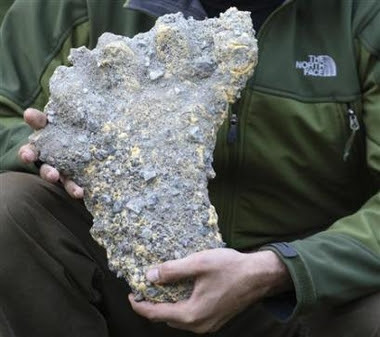 A supposed footprint of the mythical Yeti creature of the Himalayas has been cast by a Destination Truth television crew and shown to the public. The foot clearly shows what appear to be five toes. Strangely, they are splayed out and appear to be in the wrong angles. Logically, this flat, triangular arrangement would suit well for walking on snow, but biologists should really take a look at it to see if it is anatomically sound. Theorists have claimed that most Yeti footprints are the result of animal tracks which have merged together to form a single, large impression which appears humanoid in nature. Television host Josh Gates (face not shown) displays the cast of the footprint. 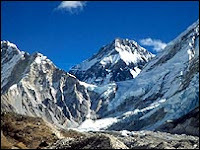 Jump here to i-Mash for related news on the whopping auction sale of a Yeti footprint depiction.